To watch a chef talk of an emerging spring season is to watch a chef light up like a candle – and to observe that chef at a spring farmer’s market is to see a (very tall) kid running around a candy store. In short – they get giddy. When we heard our executive chef, Adrian Garcia, chatting about an upcoming visit to one of his favorite farmers markets here in the Bay Area, we just had to tag along and see for ourselves what was sparking so much joy for him, and to get the inside scoop on his forthcoming spring menu. In California, we’re simply spoiled with choices when it comes to produce, any time of year. We have it good, and chefs know it. Early spring in particular is special though, because it’s when produce becomes diverse and vibrant, popping with technicolor beauty that just seems unreal. 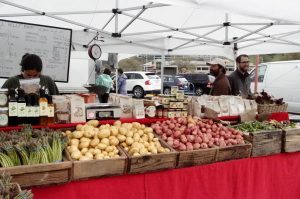 As we headed just north of the city to one of chef’s favorite markets, the Thursday Marin Farmer’s Market in San Rafael, he talked excitedly about what he was hoping to see and bring back to his kitchen. 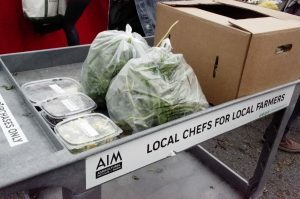 In particular, chef Adrian was looking forward to getting his hands on morel mushrooms, spring porcini, fiddlehead ferns, ramps, miners lettuce, asparagus and white asparagus, green strawberries, and purple artichoke. We asked chef, aside from the produce, what else draws him to the markets? “Building relationships with farmers, collaborating with people who share a passion for food, getting a leg up on the very best seasonal and locally produced ingredients, just getting out – walking through the market on a sunny day, or a foggy day, is super enjoyable! 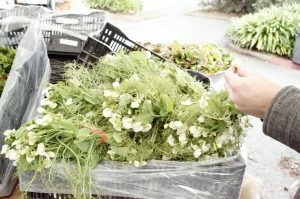 And I love to cook so it’s really exciting to see what’s been growing and flowing into the markets.” He particularly loves checking in with Brokaw Farms for avocados and citrus, Knoll Farm for green garlic, and Marin Roots and Full Belly Farm for all of their sustainably produced offerings. 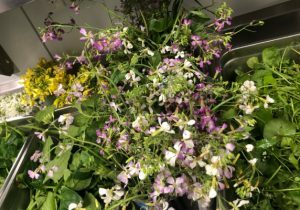 According to chef Adrian, one of the other things he loves about spring is being able to go out into the wilderness to forage for all of the amazing and tender greens, succulents, and blossoms produced during the beginning of season. He said if you’re lucky you might even come across some hidden mushrooms – a rare find. 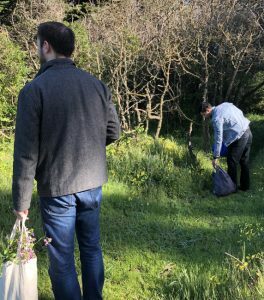 Check him out below, connecting with nature and foraging alongside his chef de cuisine Andres Flores at a secret location here in Northern California. Two very happy chefs! With all of the passion chef brings to the local farmers markets and to his foraging and cooking, guests who visit Commons Club inside of Virgin Hotels San Francisco will be in for seriously fresh springtime delight. The Spring Lamb with green garlic has already appeared on the menu, and as spring’s bounty begins to overflow the menu will transform as well. Like the seasons themselves, the menu will evolve naturally, and deliciously. Visit soon and experience the abundance of the season for yourself.